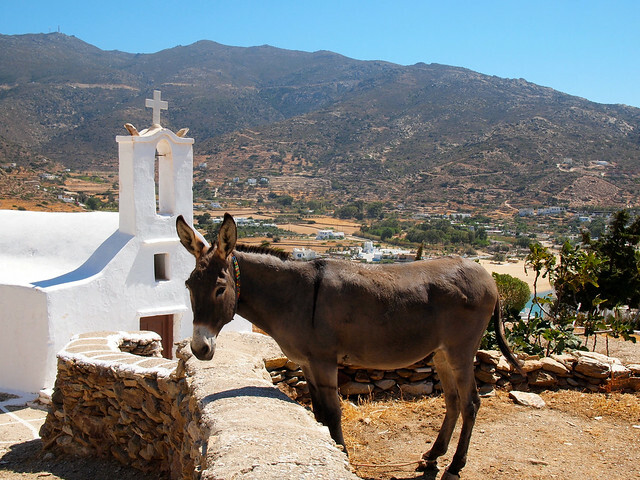 What do you picture when you think of the Greek Islands? 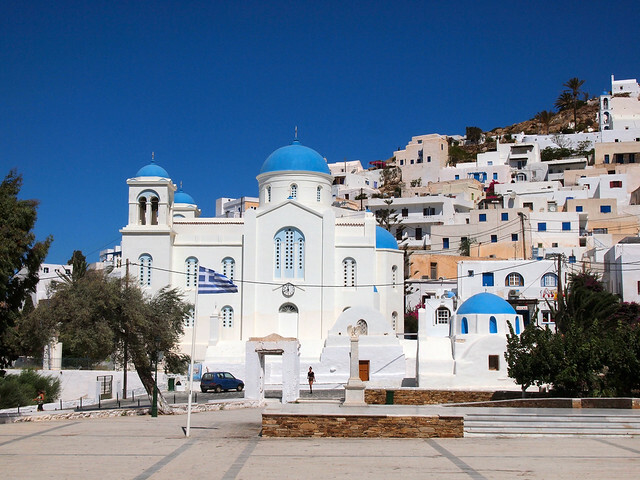 Blue-domed churches? Romantic beaches? Postcard-perfect ocean views? 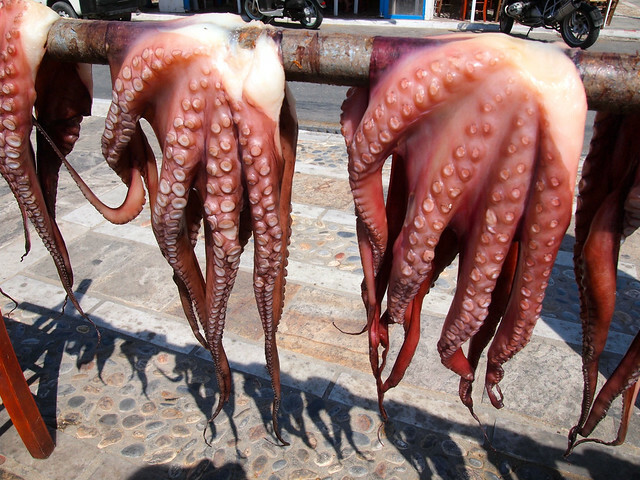 Well, I have good news for you: the Greek Islands ARE full of these things, and plenty more besides. 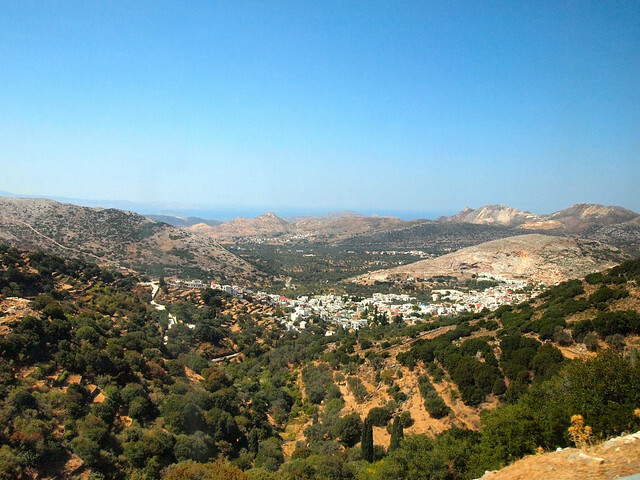 My first brief taste of Greece did not go so well; I felt no connection at all to the mainland cities like Athens and Thessaloniki that I visited last year. But the Greek Islands? They promised to be different. 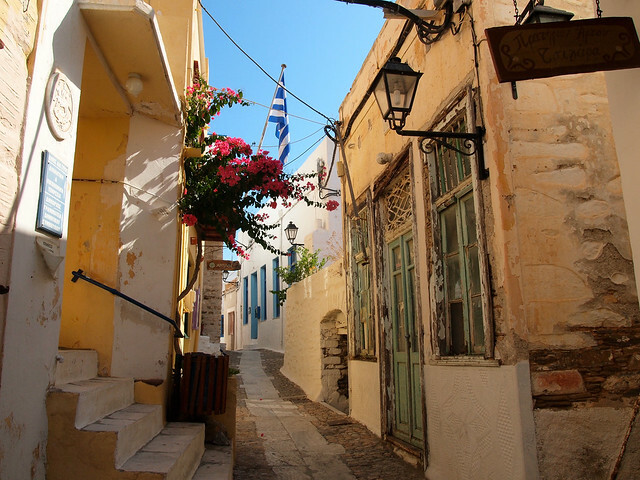 So, when I began planning the Europe leg of my round-the-world trip earlier this year, a couple of weeks in the Greek Islands was the first thing I put on my itinerary. 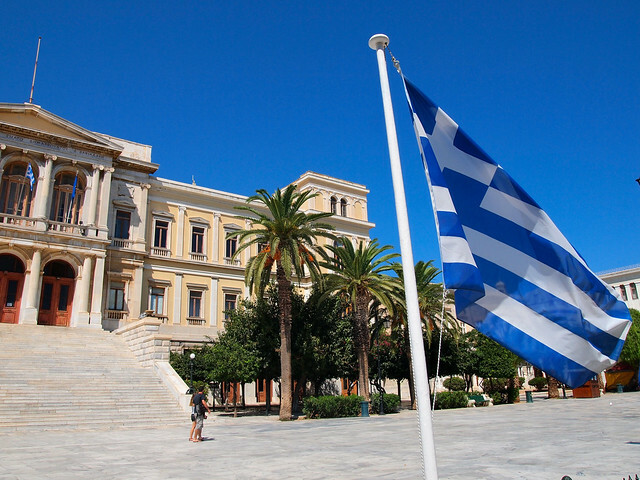 And I am SO glad that I decided to go back to Greece — because the islands BLEW. ME. AWAY. 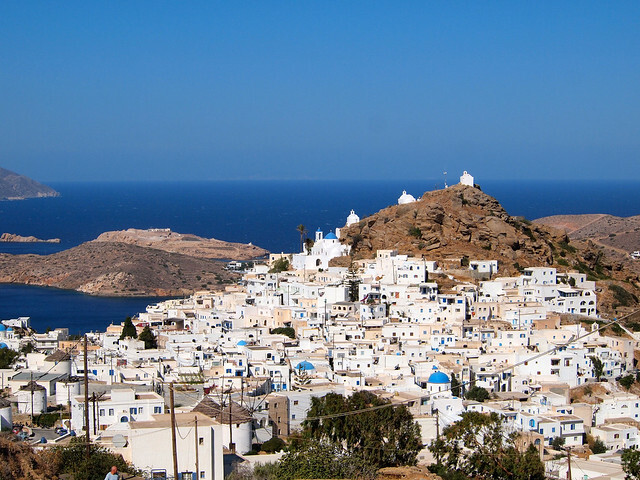 I'll be going into a lot more depth on each of the 5 islands I visited on my tour with Intrepid Travel (as well an overview of the tour itself) in the coming weeks, but I wanted to start off with what I'm dubbing “My Big Fat Greek Islands Photo Essay” — as much Greek Islands goodness as I can cram into one post. 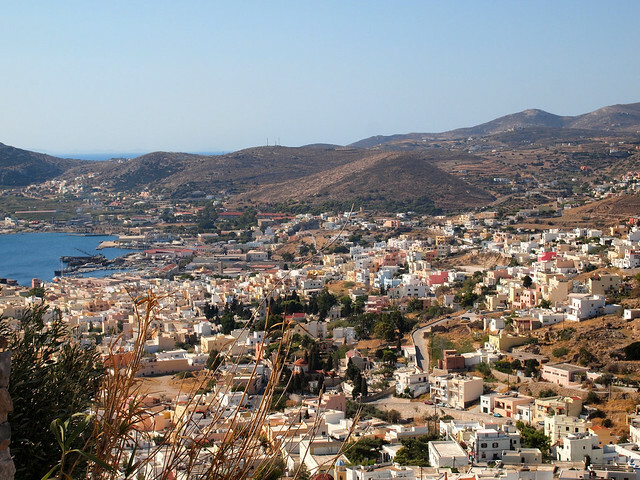 My introduction to the Greek Islands was Syros, a marble-paved, smallish-sized island in the Cyclades. There were basically no tourists on this island in early September, and so it was the perfect place to get used to the “slow-slow” pace of life in this part of the world. 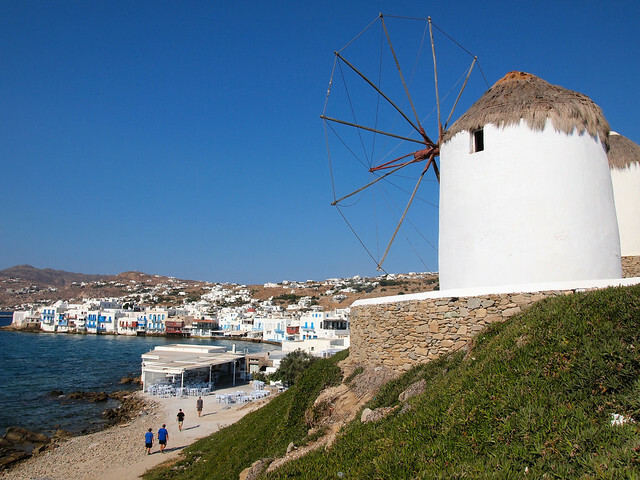 If you want to party, Mykonos is the island to visit. 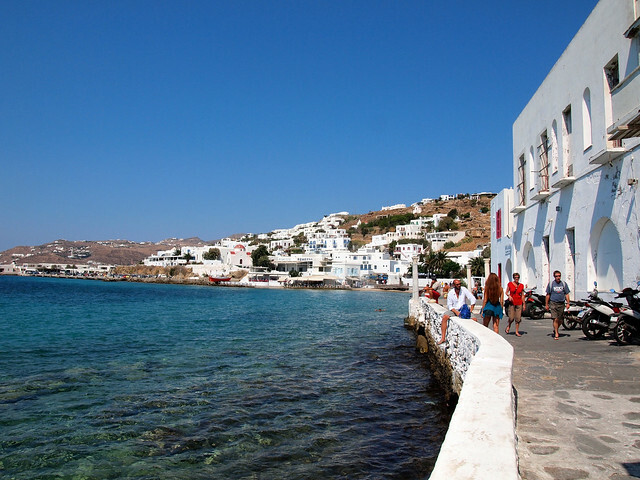 With its Paradise and Super Paradise beaches being world-famous (and also very gay-friendly) and its nightclubs being packed even in September, Mykonos was a fun second stop. Santorini. Ooooh, Santorini. This is the island you see all the postcards of blue-domed churches from. 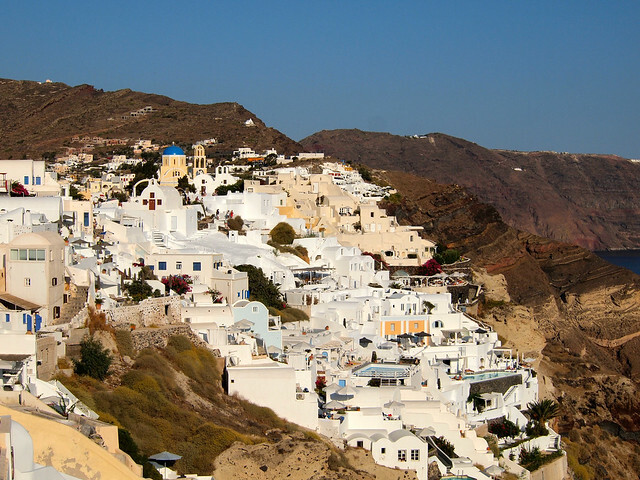 And its cliff-top villages of Fira and (especially) Oia did not disappoint in the least. A more rural island (yet still known for its party scene), Ios really surprised me with how pretty it was — in a sort of rugged, brown kind of way. If you want contrasts, you'll find them here. 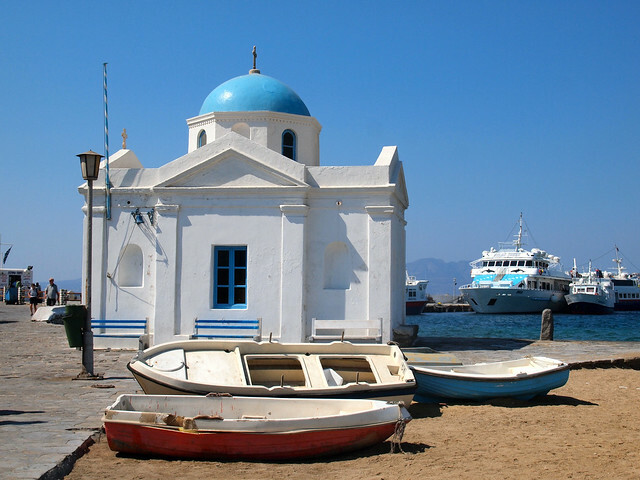 The last island we visited was also the largest — in fact, Naxos is the largest island in the Cyclades, requiring bus rides to get to its tiny, aging villages. It's also a fairly mountainous island, which was not something I was expecting to find. Stay tuned over the next couple of weeks, because there's a lot more where this came from! 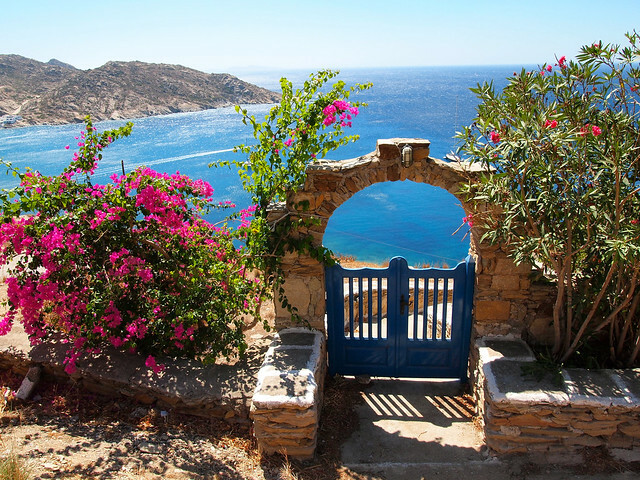 Based on photos, which Greek island would YOU most want to explore? 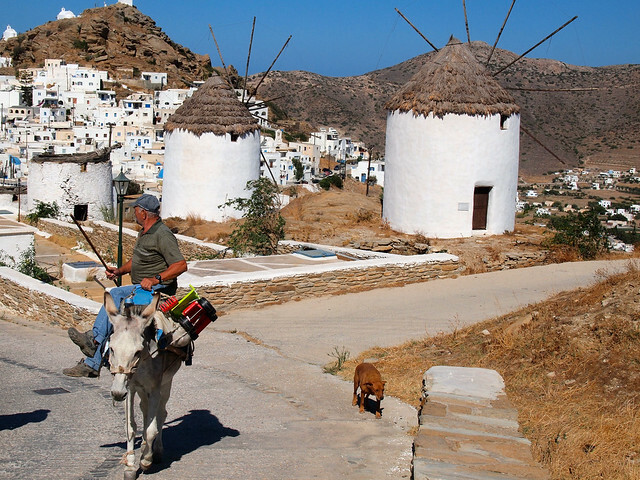 *Note: I received a complimentary Greek Islands tour from Intrepid Travel through my partnership with them. All opinions, though, as always are entirely my own. Gorgeous! I’m not sure if you have been to California, but the islands almost look like Catalina Island, which is also somewhat rugged and “brown”. Do you have to pay to sit on beaches here or are they public? I’ve been to California, but not to Catalina yet. If it’s anything like these islands, I’ll definitely have to go!! At most beaches, it seemed like you could spread a towel of your own out for free. However, since I was traveling with other people, we almost always rented beach chairs. It usually was no more than 5 Euro for 2 chairs and an umbrella (so less than 3 Euro each), and you could stay as long as you wanted. 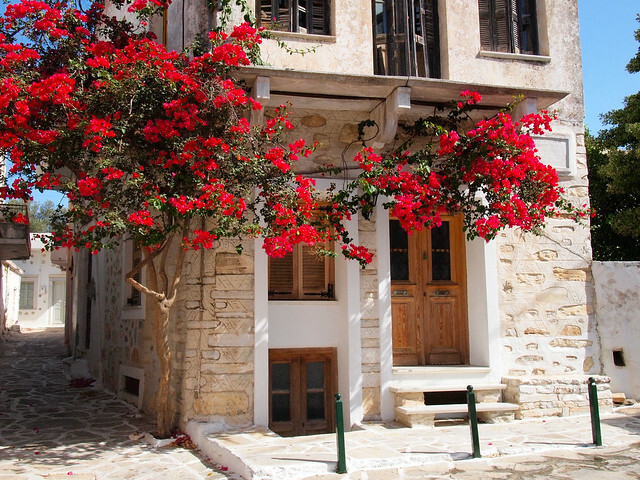 I love the Greek Islands and want to go back! Thanks for sharing your photos. I want to go back, too!!! Gorgeous pictures! 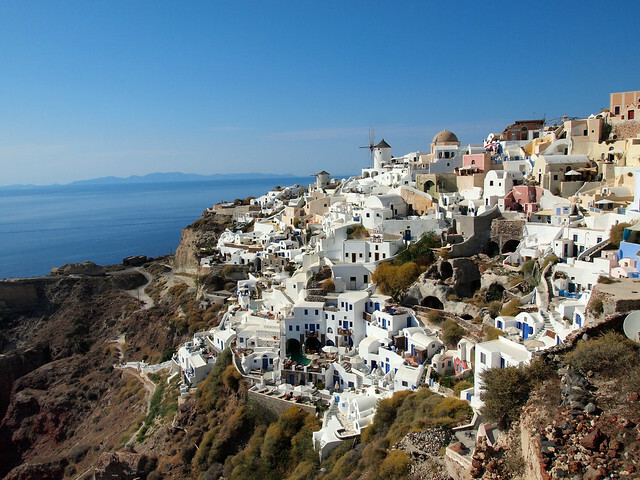 I’ve only been to Santorini of all these islands, but I wouldn’t mind exploring the others. 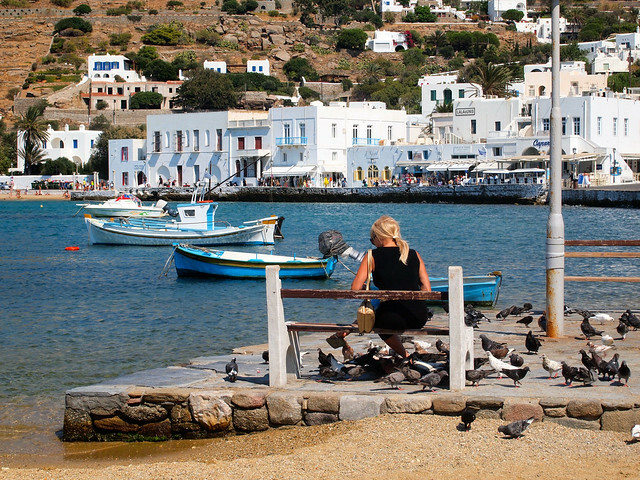 Did you feel that each island has its own culture and “personality”? YES, totally. I expected the islands to mostly feel similar, but this trip was great in that each island truly was unique! 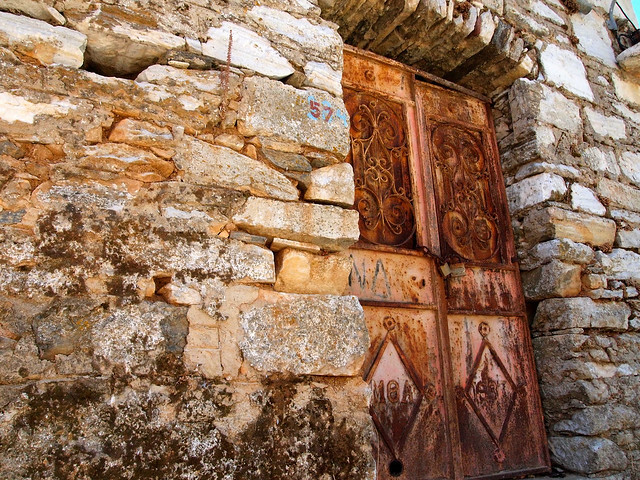 I’m really looking forward to sharing all of my Greek content in the coming weeks! Great photos! Thanks for sharing your journey. I’ve only been to Santorini so it was nice to “travel” the other islands through your photos. 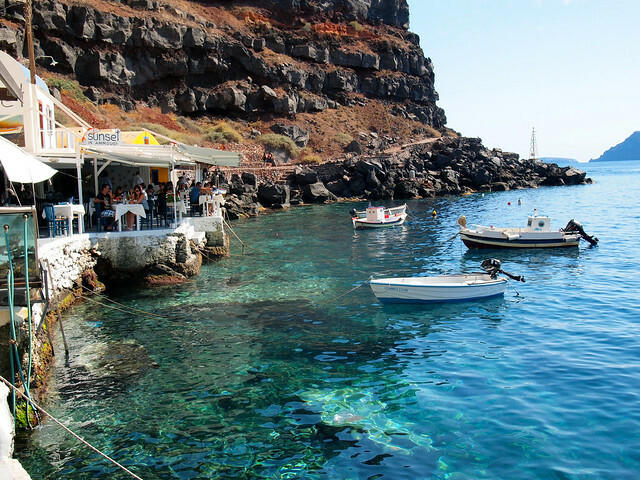 I remember how surprised I was arriving in Santorini and seeing the black sand on the beaches. Looking forward to more posts on Greece! 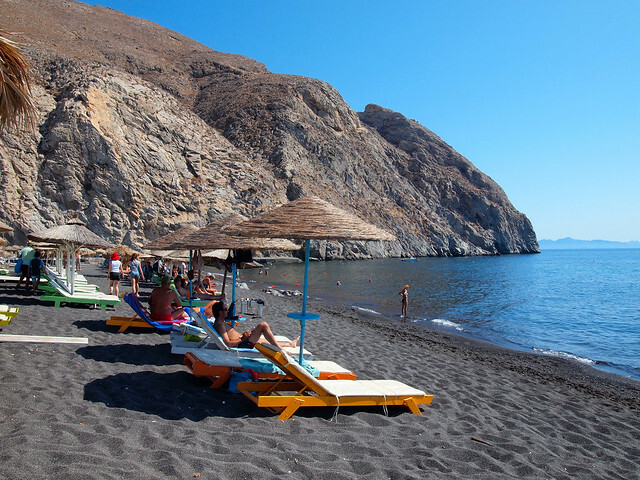 Ah yes, Santorini’s black sand beaches are gorgeous!! Glad you enjoyed the post – and stay tuned for plenty more photos. 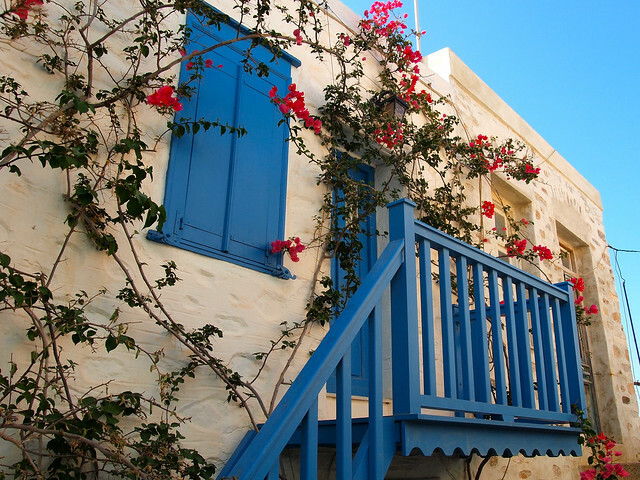 These are some really great pictures – it’s hard to go wrong with the Greek islands in later summer. 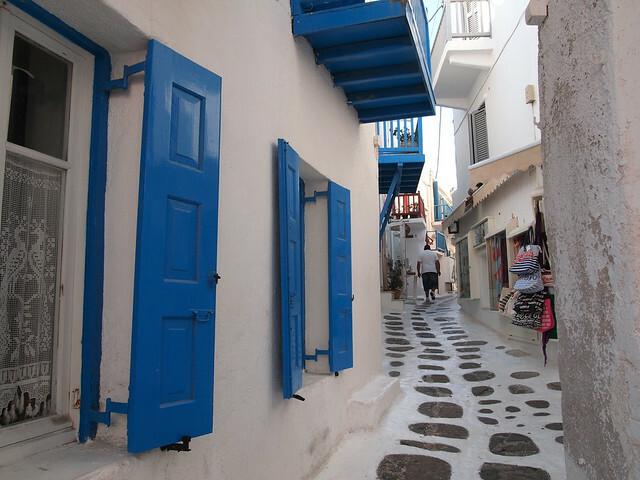 I was on Paros (an island next to Naxos) a few years ago and then travelled to Samos via Mykonos. Stepping off the boat on Mykonos I couldn’t believe how busy it was after sleepy Paros! Such a contrast. 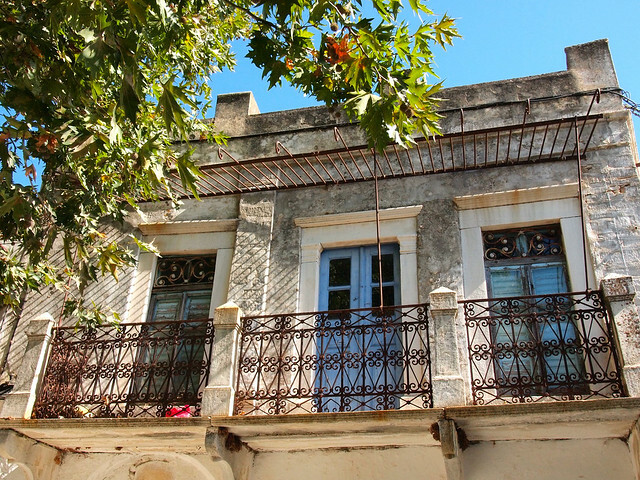 Looking forward to more Greece content coming soon on the blog! I’m really glad I waited until early September to visit the islands. 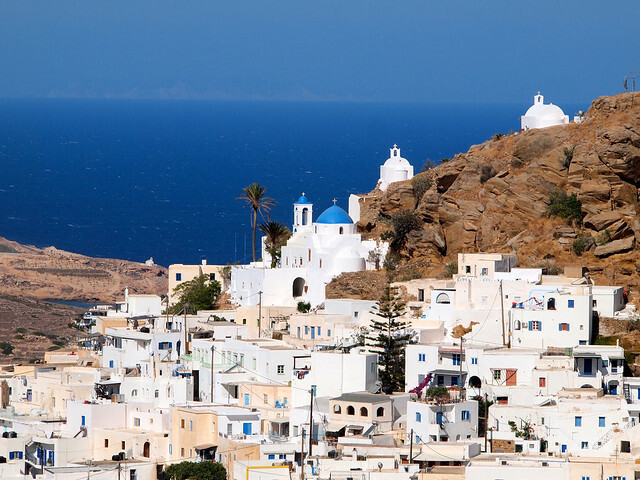 It was still quite hot, and islands like Mykonos and Santorini were still pretty crowded, but the others I visited were starting to slow down for the shoulder season. I loved it! Amazing! 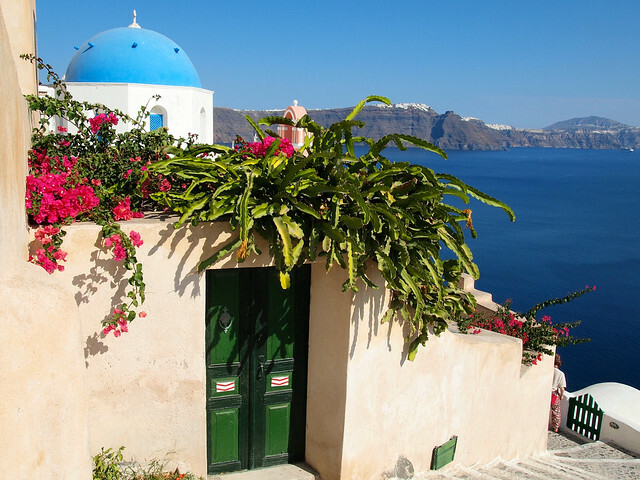 Your Santorini photos are absolutely gorgeous. I can’t wait to get out there and see it all for myself! I would highly recommend it – I can’t wait to go back myself someday! They all look gorgeous! I always thought these islands were extremely touristy. Did you go off season or did you just manage to some how avoid the masses? I went in early September, so it was basically the end of the season. 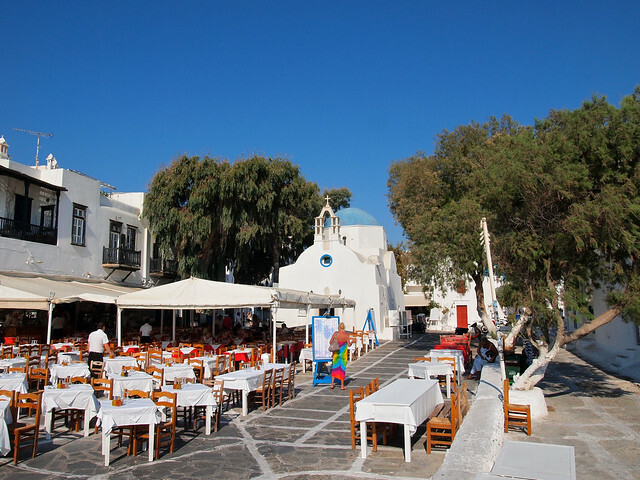 Most of the huge crowds had gone (though there were still cruise ships docking on Mykonos and Santorini), but it was still really warm and most of the tourist infrastructure was still running. Any later, and I probably would have been met with a lot of restaurants and things being closed. What a great post for a dreary day! I will have to bookmark this page to help me that blue skies and sunshine does exists during the long Seattle rain season! Beauty!!! 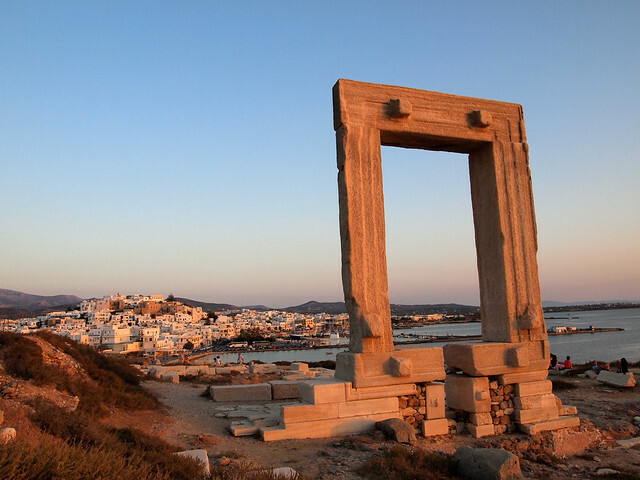 I would LOVE to visit Naxos! Looking at these pictures make me want to plan my next trip to somewhere warm! Absolutely stunning! 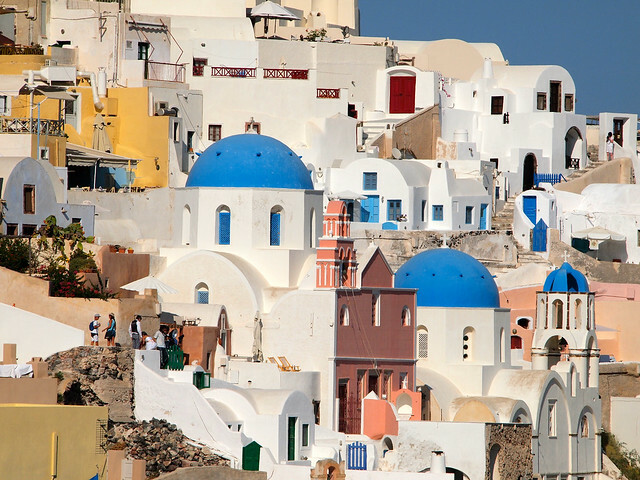 I’d love to see them all but if I had to pick just one I would want Santorini. The blue domed churches just enchant me. 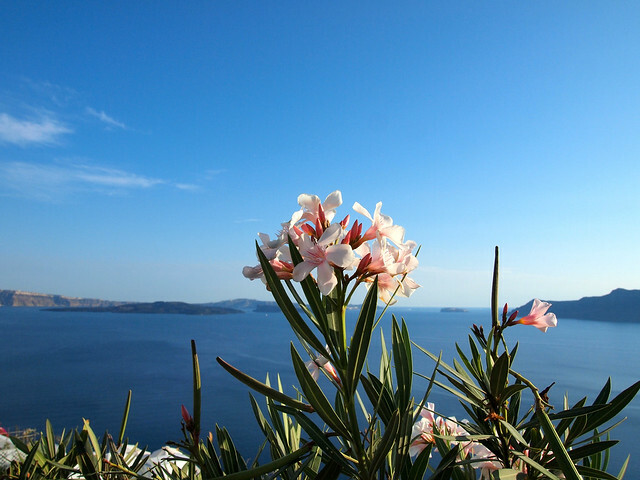 Santorini was the one I was most looking forward to as well – and for the same reason! It definitely did not disappoint. Though I will say that some of the other islands were just as pretty, just in different ways! So gorgeous! 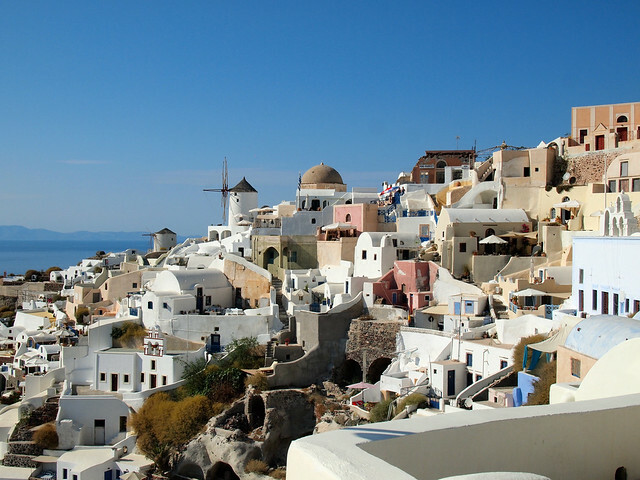 I’ve only been to mainland Greece (and actually really loved it), but I have a feeling the islands would blow me away. Can’t wait to go someday! Well they certainly blew me away! I’m glad, because there’s nothing worse than having high expectations for a place and then having it disappoint you. I hope you make it to the islands someday! It’s hard for me to choose a favorite, too – they were all so different, and all so gorgeous! Agreed! It totally lived up to my expectations, which is saying something since just about EVERYone has certain expectations of the Greek Islands. Thanks, Allison! You definitely should go! Thanks, Rebecca!! I miss these islands, too. Hi there, great pictures! 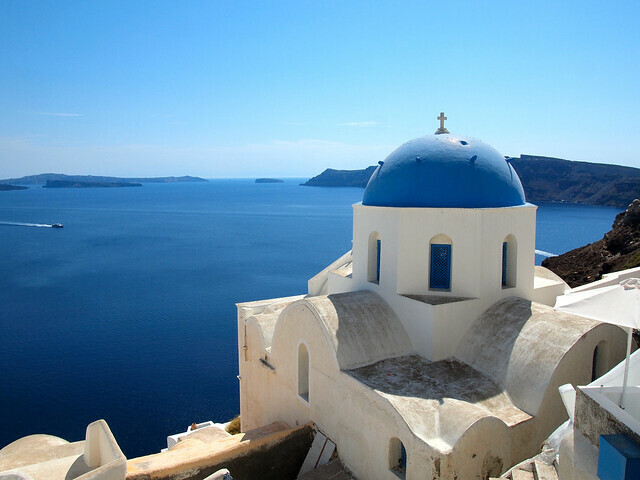 I came across this blog as I was researching the Intrepid tour for the Greek isles. Did you do the 8 day tour? 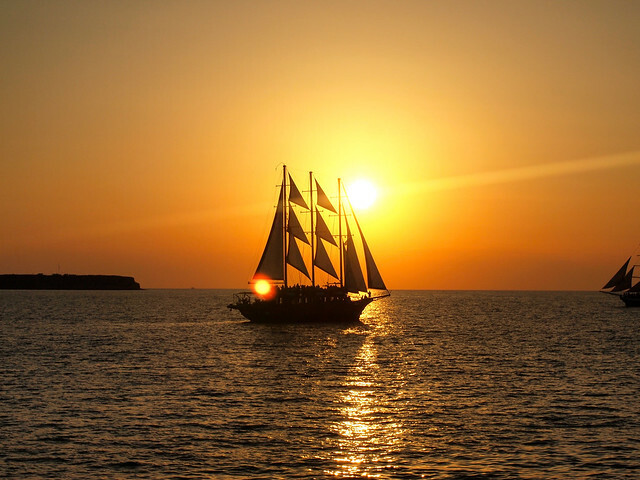 I would love to hear your thoughts on the boat experience etc. Hey Belinda! Great to hear that you stumbled across my blog. 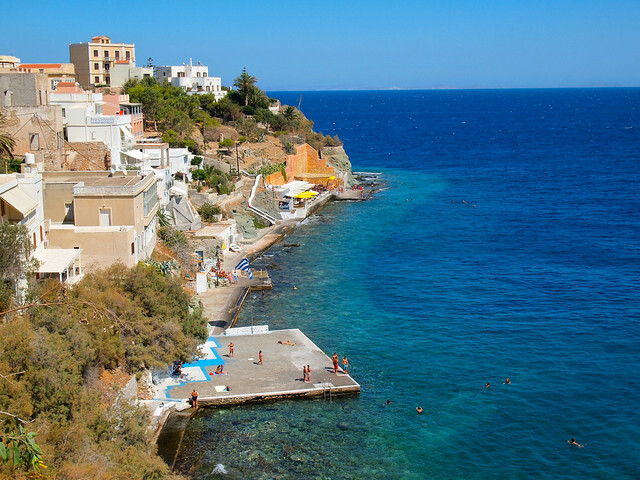 I actually did the 15-day trip (it’s two separate trips put together; Athens to Santorini and Santorini to Athens) where you stay on the islands (no sailboats involved, only ferries). I’ll be putting up a complete review of it next week (early December). Thanks for sharing your experiences. 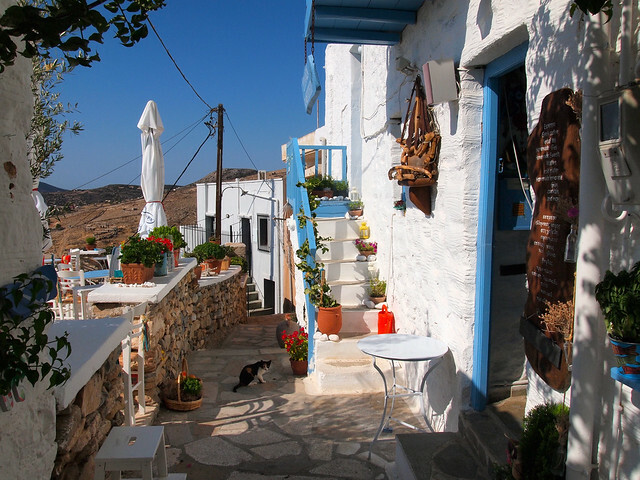 I just got back from almost the same itinerary: Santorini, Naxos, Syros and Mykonos. Your photo essay inspires me to get back into blogging. You make it look simple. The islands look incredible and fun! I love your pics, I got hooked up on your blog recently! Can I ask you is it canon you are shooting with? I loved them! And actually I’m shooting with an Olympus (a mirrorless model)! That’s great!! Can’t wait to read about your new adventures! I went with a tour group, so I’m not entirely sure what the costs would average out to per day (plus, it would depend if you were planning to stay in hostels or hotel rooms, and also whether you were traveling in the low or high season). If you went suuuuper cheap, you might manage on $50 a day. But I think $100 per day is probably more realistic.